Chelsea Clinton wished the Church of Satan a Happy New Year. We always knew Hillary Clinton was pure evil, Chelsea Clinton “tweeting” it up with the Church of Satan is beyond bizarre. 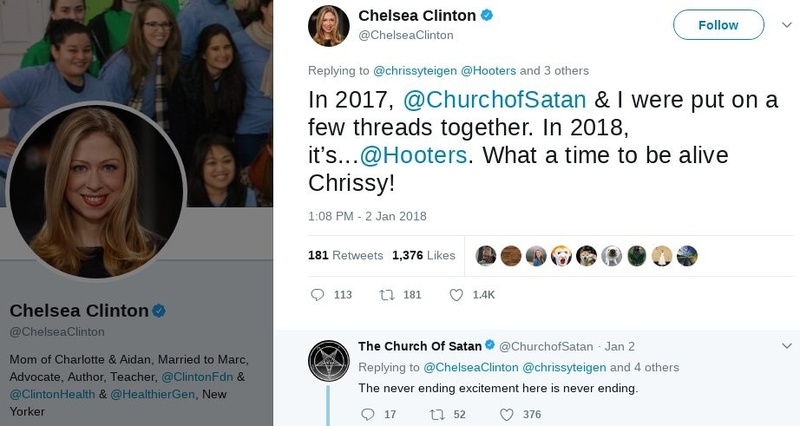 On Tuesday, the daughter of Bill and Hillary Clinton, Chelsea Clinton, traded Happy New Year greetings with the Church of Satan via twitter. Chelsea was apparently commenting on the Chrissy Teigen Pizzgate Twitter storm she got involved in earlier in order to comfort Teigen. Each to his own….fascinating though…if you believe in Satan…then you have no choice but to believe in a God….who will accommodate you with him for eternity in the “Inferno”….